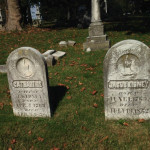 One of the neat things about wandering around in cemeteries is that you never know what you might find. That was certainly true with this tombstone I found near the children’s section of Mount Calvary Cemetery in Columbus. I saw the back of the stone first. The motif was so sweet, I was sure that it was for a child. Back of Matt Chopps tombstone, Mount Calvary Cemetery, Columbus, Ohio. Photo by Amy Crow, November 2010. It is always sad to find a child’s grave. But the back of this tombstone was so unusual that I had to know more about whose grave it marked. 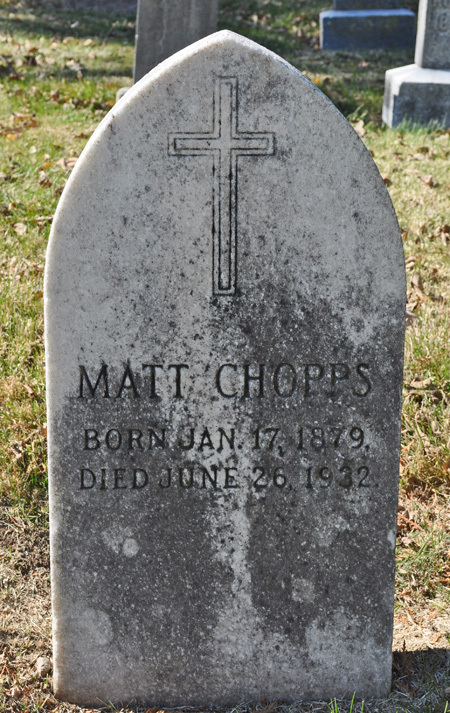 When I walked to the front of the tombstone, I was surprised to find that it wasn’t for a child, but for a 53-year-old man named Matt Chopps. 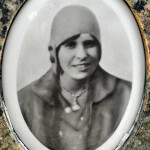 Front of Matt Chopps tombstone, Mount Calvary Cemetery, Columbus, Ohio. 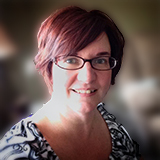 Photo by Amy Crow, November 2010. Maybe the tombstone was wrong. Maybe one of the dates was incorrect. 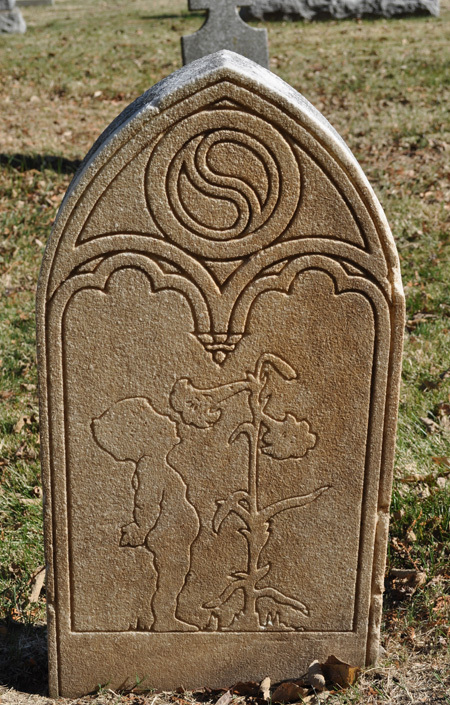 Why was there such a sweet, childlike design on the back of the tombstone for an adult? I found his death certificate and, sure enough, the tombstone was right. Matt Chopps was born 17 January 1879 in Austria and died in Columbus on 26 June 1932 of tuberculosis. He was the son of John and Katherine (Werchel) Chopps and the husband of Matilda. He was a laborer at Columbus Packing Company. If I had to picture the tombstone of a 53-year-old meat packer who died in the early 1930s, this wouldn’t be it. Was the design on the back a reflection of a kind personality? Was it just a design that the family liked? We may never know the story behind why that design is there, but this unexpected tombstone turned out to bring an unexpected smile in the cemetery. Reference: Matt Chopps death certificate, Columbus, Franklin County, Ohio, certificate 36308 (1932), viewed on FamilySearch.org. You’re exactly right, Cynthia! We’ll likely never know why this design was chosen or what it was supposed to represent. But one thing is certain — he wasn’t the person I expected to find there! Could he have loved nature and/or gardening? Took time to spell a flower and enjoy life? Maybe, though that would be pretty unusual for a tombstone of that era. They didn’t show many hobbies on tombstones back then. It could be “stop and smell the flowers,” but that wasn’t a common sentiment at the beginning of the Great Depression. I read your posting of Matt Chopps…..and have a picture of his tombstone….he is the brother of my grandfather Pete Chopps deceased since 1959. thanks for letting me know about the tombstone, as I have only the front, will have to go back and get the back now thanks for looking him up I do appreciate your kindness. Thanks for contacting me! Always neat to hear from a relative of someone I’ve written about. Any idea about the meaning behind his tombstone?